View of Long Island Sound from Caumsett State Park. 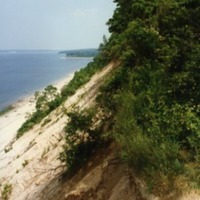 A photograph of a bluff overlook of the Long Island Sound from Caumsett State Park Preserve in Huntington. Canadian Geese at Caumsett State Park. 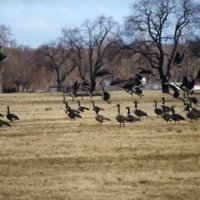 A photograph of Canadian geese in an open field at Caumsett State Park Preserve in Huntington. 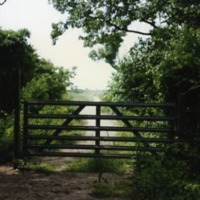 A photograph of a fence at Caumsett State Park Preserve. 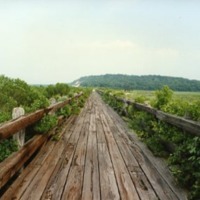 A photograph of a boardwalk at the Caumsett State Park Preserve in Huntington, New York. 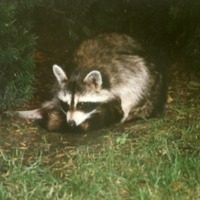 Raccoon at Caumsett State Historic Park Preserve.